One of the biggest threats facing humanity is climate change, and reducing the amount of CO2 that we're pumping into the atmosphere is the only way to mitigate its effects. But now we might get something useful out of that transition - thanks to a team at George Washington University. 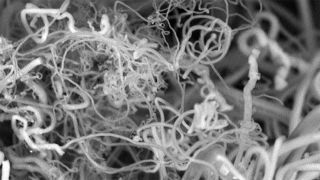 They've come up with a method of pulling carbon dioxide out of the atmosphere and using sunlight to turn it into carbon nanofibres - a material used in high-end construction projects. "Such nanofibers are used to make strong carbon composites," explains Stuart Lich, who led the research, "such as those used in the Boeing Dreamliner, as well as in high-end sports equipment, wind turbine blades and a host of other products." His process requires only a little electricity, sunlight and carbon dioxide. The gas is broken down at high temperatures, then reformed as fibres using nickel and steel electrodes. A photovoltaic cell powers the process, and the sunlight is also used to heat the chamber where the gas breaks down. "We calculate that with a physical area less than 10 percent the size of the Sahara Desert, our process could remove enough CO2 to decrease atmospheric levels to those of the pre-industrial revolution within 10 years," said Licht. "We are scaling up quickly, and soon should be in range of making tens of grams of nanofibers an hour." The team presented its results at a meeting of the American Chemical Society.